This week's meal prep was a Mexican feast! Something about the cold weather today motivated my husband and me to stay in a cook! 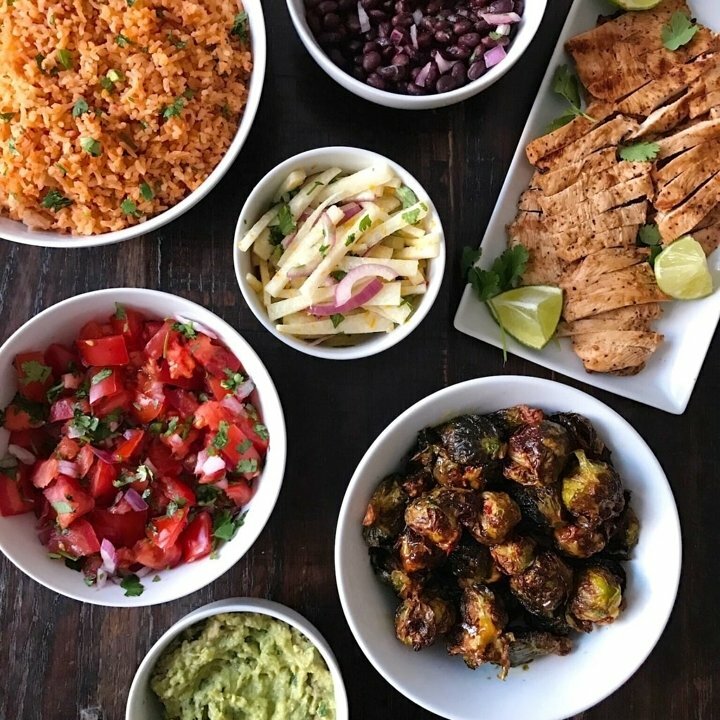 Our favorite Mexican rice, simmered black beans, Mexican-spiced grilled chicken, tangy orange jicama slaw, tomato salsa, guacamole, and pineapple-glazed Brussel sprouts. Each dish was simple to make but since we made so much, it required both of us in the kitchen for a couple hours but it was worth it! There was something for everyone and extras for the next few days! Heat olive oil in a medium sauce pan. Add red onion and saute till just getting tender, approximately 3 minutes. Add water, cumin, ground red pepper, chicken or vegetable broth, and black beans, and let simmer on low till liquid mostly absorbed. Combine pineapple juice, tamari, brown sugar, crushed red pepper flakes in a small saucepan. Bring to a boil, reduce to a simmer until sauce thickens. I haven’t done so but I assume you could roast the brussel sprouts instead. Pour the glaze over the cooked brussel sprouts and gently stir in. Core and cut tomatoes, sprinkle with salt and let sit in a colander for 20 minutes to drain excess water. Mix with red onion, cilantro, jalapeño, and lime juice. Mix together cilantro, red onion, lime / lemon juice, and salt to taste.